•86% of these young people reporting at least one personal barrier, including living in an area of deprivation, not being in education, employment or training, coming from a low-income family. For over a century, UK Youth has been a distinguished charity for young people, supporting them to learn the skills and competencies they need for life. As part of our commitment to young people for over 65 years UK Youth has operated our Outdoor Activity Centre at Avon Tyrrell. 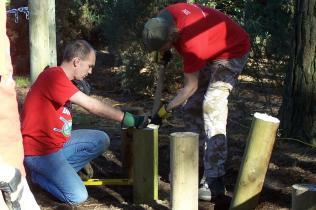 Dedicated to the continuous development of young people by providing inclusive outdoor learning, Avon Tyrrell recognises and rewards achievements made outside the classroom and uses its stimulating locality within the New Forest National Park to allow individuals to ‘Experience, Learn and Develop’ giving them the opportunities they need to reach their full potential. Whether at Avon Tyrrell or via our UK network, UK Youth strives to provide the building blocks for a solid foundation, helping develop personal awareness skills such as; confidence, self-esteem, communication and character building and improving social skills and wellbeing that have a positive social impact and enriches the lives of Young People. If you are interested in making a donation to support UK Youth and the work we do for young people at Avon Tyrrell, please visit the UK Youth website to make your donation. We are extremely grateful for any contributions to our work. We have continual support for the work that we do across the charity and it is because of our volunteers that we are able to maintain and improve the incredible facilities that we have for young people here at Avon Tyrrell.